What are lymph nodes? Lymph nodes are a part of the lymphatic system which consists of lymph vessels, nodes, and organs. Nodes are lymphatic tissue disseminated all throughout the body, mostly in the neck (cervical), armpit (axillary), chest (mediastinal), stomach (para – aortic, mesenteric, elbow (epitrochlear), knee (popliteal) and inguinal (femoral). There are primary and secondary lymph organs. Primary lymph organs are bone marrow and thymus. Secondary ones are spleen, lymph nodes, tonsils, Payer’s plates. Inside of the vessels, there is a fluid called lymph, which in charge for retention of the extracellular fluid and fighting the infection and disease by catching the foreign objects and getting rid of the body waste. When does the calcification happen? What Is The Main Function Of The Lymph Nodes? As a part of the immune system, the most important part of the lymph nodes is preventing the infection by keeping the foreign organisms localized and not letting them affect the body. It is the natural filter which our organism uses all the time to prevent bacteria, cancer, and other invaders from causing damage. It contains a concentrated amount of white blood cells, also called lymphocytes, where they get exposed to microorganisms and other pathognomonic organisms. Subsequently, white blood cells present this to the body, stimulating the system to produce antibodies for a specific cause. This allows the body to fight the infection leading to recovery. The lymph nodes are a tissue which is encapsulated, so when there is a high production of the lymphocytes or action of actual abstraction of the pathogens, they can swell, leading to inflammation and painful palpatory bumps on the specific places on the skin. The result of calcium deposit inside the lymph node can happen by reaction of granulomatous tissue which strives to restrict the change and heal the infection. This consequence can happen during some diseases, for example, in the lungs such may cause disease like tuberculosis or histoplasmosis, which is known to it’s generating the granulomas inside the tissue and during the time, a deposit of calcium. This is commonly mistaken to be asthma or bronchitis as they can get solid and compress the windpipe, provoking the cough and breathing difficulties. 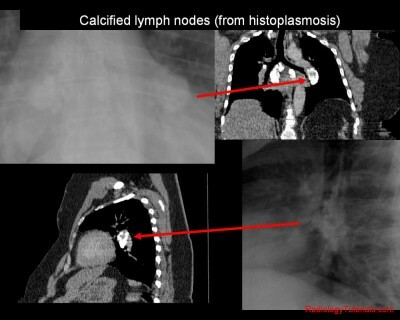 What Can Cause Lymph Node Calcification? All of this calcified changes can be seen on X-ray imaging like white spots, bone-like structure. This is because of the calcium, which leaves the node solid and doesn’t let the X-rays go through but reflects the light back. I Have A Calcified Node, Is It Serious? The most important indication of the calcification of the lymph node is that something is happening inside your body. It could be due to infection, sexually transmitted disease, cancer. This is the result of granulomatosis tissue making a scar inside the lymph node preventing it from spreading. In the case of cancer, it can be cancer inside the lymph node, like Hodgkin’s disease, but usually, it is an indication of spreading the tumor from another part of the body through the lymph system which leads to metastasis and dissemination that can’t be a good thing. In this cases, if only the regional lymph nodes are affected, doctors usually opt for a removal of the lymph nodes as for primary cancer that is the main cause for this state. It depends on the stage of the cancer spread, which can be measured by TNM system which means the spread of the tumor, the number of affected lymph nodes and presence of metastasis. If the metastasis has taken over the body, the prognosis for this is bad and operation has low chances of success. They determine the therapy that consists of radiation and chemotherapy. How Do They Appear On X-Ray? 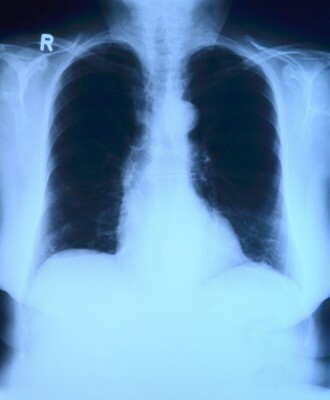 Normal X-ray looks homogeneously, where soft tissue from blood and other liquids have some spectra of gray color, fat looks transparent and the bone has solid white color on the image. There are no white marks inside the tissue and the position of all the organs looks normal, where is no abnormal movement of the organs due to calcified nodes push. 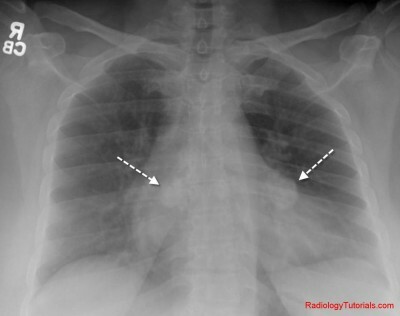 Here is an example of calcified chest lymph nodes where they appear lighter than the rest of the surrounding tissue and even they have an appearance of a star, which happens often with cancer calcification. This can be also seen on the computerized tomography (MRI). Previous articleIs Lucid Dreaming Dangerous?